The Green Bay Packers were a surprising 2-1 as they faced the tough Los Angeles Rams on October 16, 1955. Coached by Lisle Blackbourn, they were coming off a 4-8 record in ’54 and had not posted a winning record since 1947. Talented, if erratic, QB Tobin Rote led a revived offense that also featured end Billy Howton and FB Howie Ferguson. 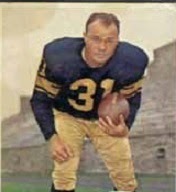 The defense was tough and included LB Roger Zatkoff and safety Bobby Dillon, and backup FB Fred Cone (pictured above) was also a reliable placekicker. Los Angeles, typically a contender in the Western Conference, was off to a 3-0 start and the favorite against the Packers. The head coach, Sid Gillman, was new, but there were many savvy veterans on the team, including QB Norm Van Brocklin, FB Tank Younger, and ends Tom Fears and Elroy “Crazylegs” Hirsch. HB Ron Waller was a promising rookie and second-year QB Bill Wade was available to spell Van Brocklin. There were 26,960 fans in attendance at Milwaukee’s County Stadium. Less than two minutes into the game, Tobin Rote tossed an errant pitchout that FB Howie Ferguson couldn’t handle and DE Andy Robustelli picked it up for the Rams and returned it 18 yards for a touchdown. Les Richter added the extra point to give the visitors the early 7-0 lead. Later in the first quarter, the Packers got a 34-yard field goal by Fred Cone. Green Bay then put together a nine-play, 63-yard drive with Rote passing effectively that resulted in a seven-yard touchdown throw to HB Veryl Switzer. Cone’s conversion had the home team in front by 10-7 heading into the second quarter. LB Deral Teteak intercepted a Van Brocklin pass that produced another score for the Packers. Green Bay went 34 yards in four plays, the first three of them runs and the last a pass from Rote to end Gary Knafelc, who grabbed the ball away from two defenders and ran into the end zone for a 16-yard TD. The Packers went into halftime with a 17-7 lead. The Packers added to their lead on the fourth play of the third quarter as Rote threw to Billy Howton for a 57-yard touchdown. Cone again made good on the extra point. Down by 24-7, the Rams responded with a series that traveled 66 yards in six plays. QB Bill Wade both ran and passed LA down the field, connecting with Ron Waller for a 15-yard TD. Richter added the PAT to make it a ten-point contest. As rain began to fall, the Packers correspondingly cooled off on offense. DHB Jim Cason (pictured at left) intercepted a pass by Rote to give the Rams the ball at the Green Bay 35. In a four-play series that extended into the fourth quarter, Van Brocklin, who was not at his best throwing the ball on this day, guided the Rams to another score. Again it was Waller getting the touchdown, this time on a five-yard carry to start the fourth quarter. The Packers finally added to their lead when Cone booted a 45-yard field goal to make the score 27-21. Green Bay’s defense then kept the Rams in their own territory, but Van Brocklin’s 52-yard punt pinned the Packers back at their 14 in turn. Ferguson, gimpy with an ankle injury, could gain only three yards on two carries and, when Rote went to the air, Cason picked him off again and returned it 25 yards for a touchdown. Richter added the extra point that put the visitors ahead by 28-27. Cason struck for a third time by picking off a long throw by Rote, giving the Rams the ball on their 15 with the clock down to 2:13. However, Los Angeles did a poor job of running time off the clock, going with three running plays that used a total of 26 seconds of playing time. Van Brocklin got off another long punt that traveled 65 yards, but HB Al Carmichael returned it 40 yards, weaving his way to the LA 30 where DHB Ed Hughes brought him down. Rote rolled out and, finding no receivers open, ran for 11 yards down to the 19. He also got out of bounds to stop the clock, but was stopped for no gain and stayed in bounds the next time. With 24 seconds left to play, Cone kicked a 25-yard field goal that just barely made it inside the uprights to put the Packers back on top. The Rams still had time for two plays following the kickoff, but time ran out with the ball at their 33 and Green Bay came away with a 30-28 win. The Packers had the edge in total yards (343 to 260) and first downs (20 to 16). However, they also turned the ball over six times, to three suffered by LA, and the Rams recorded three sacks, to one by Green Bay. 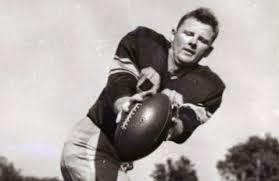 The Packers also were successful on three field goal attempts, while the combination of Les Richter and Tom Fears missed three for Los Angeles. Tobin Rote completed 19 of 40 passes for 255 yards and three touchdowns, but tossed five interceptions as well, three of them by Jim Cason. Billy Howton (pictured below) caught 8 passes for 158 yards and a TD while, for the Rams, Ron Waller rushed for 77 yards on 14 carries. The win put the Packers in a tie for first in the Western Conference, but the bubble burst and they lost their next four games on the way to a 6-6 third-place finish. The Rams came out on top of the conference at 8-3-1, although they lost badly to the Cleveland Browns in the NFL Championship game. Tobin Rote went on to lead the NFL with 17 touchdown passes (tied with San Francisco’s Y.A. Tittle). Billy Howton caught 44 passes for 697 yards (15.8 avg.) and scored five touchdowns, and was named to the Pro Bowl. Fred Cone was successful on a league-leading 16 of 24 field goal attempts and all 30 of his PATs.